LOS ANGELES, CA. — Seattle Seahawks coach, Pete Carroll, recently returned to USC on Wednesday evening, February 26, to speak with students on his Win Forever philosophy and about his success with the Seahawks. He spoke about his time at USC, the Seahawks championship run, and USC’s new coach Steve Sarkisian. Carroll also spoke out against the NCAA and the sanctions imposed on USC. 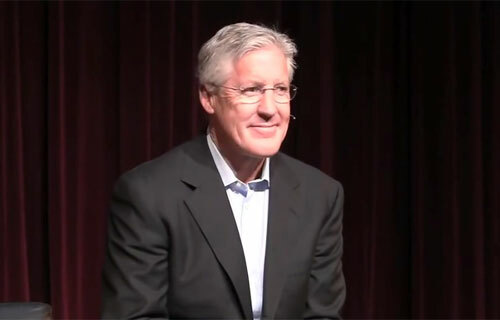 Photo shows Pete Carroll speaking at USC on February 26, 2014, about the Seahawks. Carroll joined the Seahawks in 2010 where he led his team to consecutive AFC Championship appearances and a Super Bowl Championship in 2013. Before joining the Seahawks, Carroll spent 9 years at USC and led the Trojans to two national championships in 2003 and 2004 and seven consecutive Pac-10 titles from 2002 to 2008. Sports Speakers 360 is a booking agent for motivational sports speakers. If you would like to book sports legends like Pete Carroll for an event, contact Pete Carroll’s booking agent for appearance & speaker fees. For booking & appearance fee information on how to hire Seattle Seahawks players for appearances, call 1.855.303.5450.